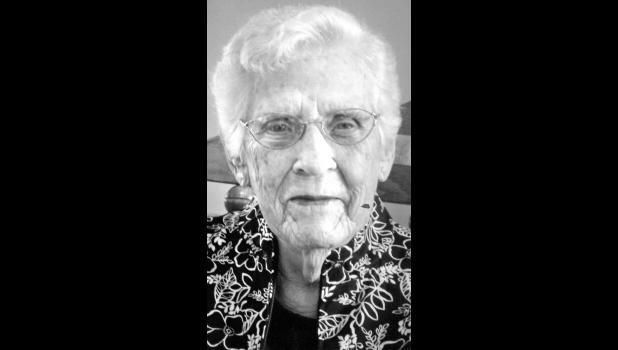 Maxine B. VanDonge, 95, Holton, died Tuesday, Oct. 9, 2018, at Medicalodges Jackson County. She was born Aug. 17, 1923, in America City, the daughter of Lewis and Bertha Nichols Sumner. She attended Anderson and Buck’s Grove country schools and graduated from Soldier High School in 1941. Mrs. VanDonge was a homemaker and farmwife. She was a member of Soldier Christian Church. She married LaVerne E. VanDonge on Aug. 17, 1941, at her parents’ home in Soldier. He died Nov. 7, 1988. She was also preceded in death by two sons, Robert E. VanDonge and Donald V. VanDonge; four sisters, Gertrude Staehli, Sue Curtis, Betty Sackrider and Ruth Allen; three brothers, Robert, Harlen and Russell Sumner; and a grandson, Kelly VanDonge. Survivors include two sons, Larry L. VanDonge and wife Linda, Soldier, and Ronald D. VanDonge and wife Becky, Ozawkie; two daughters-in-law; Katherine VanDonge, Redding, Calif., and Nancy VanDonge, Soldier; 11 grandchildren, Kristi Suarez and husband Gus, Kerri Smith and husband Garry, Karla Tanking and husband Andy, Kevin VanDonge and wife Shelly, Kim Ganoe and husband Corey, Timothy VanDonge and wife Kristan, Ted VanDonge and wife Melissa, David VanDonge and wife Rachel, Dan VanDonge and wife Angie, Cory VanDonge and Kolby VanDonge and wife Angie); a stepgrandchild, Patrick Isbell; 28 great-grandchildren; and six great-great-grandchildren. Funeral services will be held at 10:30 a.m. Friday at Mercer Funeral Home in Holton. Burial will follow in Soldier Cemetery. Family will greet friends from 5 p.m. to 6:30 p.m. Thursday at the funeral home. Memorial contributions may be made to Jackson County Friends of Hospice or Soldier Christian Church, sent in care of Mercer Funeral Home, P.O. Box 270, Holton, KS 66436.